Professional Liverpool is always on hand to support their members in order to help them improve their businesses in any way they can and to increase their network of contacts. Already in 2018 PL has collaborated in a series of network events arranged to give members the opportunity to listen to the views of a variety of prominent guest speakers and at the same time enable them to meet new people and increase their portfolio of contacts from within the local business community. In this issue of My Planet Liverpool we highlight three of these events. The first networking lunch of 2018 was held at the Old Hall at the Cotton Exchange, Bixteth Street on 24 January and the afternoon’s guest speaker was Paul Fitzpatrick, Director of Estates and Facilities Aintree Hospital NHS Foundation Trust. Paul, who joined the NHS in 1994 as a Project Engineer, delivered an interesting and eloquent talk on ‘The challenges of managing the NHS estate during these difficult times of austerity.’ Since joining the NHS, Paul has held a series of posts primarily working on developing and delivering trusts capital programme and including the successful delivery of many significant strategic developments, including several NHS Procure 21 schemes. Paul became Deputy Director of Estates in 2001 and subsequently Director of Estates in 2003 at Stockport NHS Foundation Trust. In 2008 the opportunity arose to move to Liverpool as Director of Estates & Facilities at Aintree University Hospital NHS Foundation Trust. Aintree University Hospital Estates and Facilities Team now also deliver management of associated hard and soft FM teams at other local trusts; Walton Centre, Liverpool Heart and Chest Hospital and Liverpool Women’s Hospital- further extending Pauls sphere of influence. 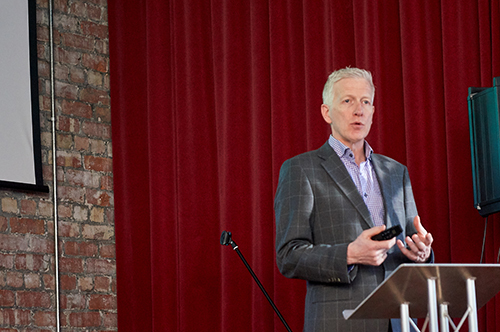 Professional Liverpool returned to the Cotton Exchange’s Old Hall on 5 February, on this occasion for a workshop hosted by Dave Verburg of Asentiv, a company that specialises in helping businesses to grow through creating a team of professionals who want to work and succeed together. The workshop focused on ‘Making The Most Of Your Networks’. The event, very popular with PL members, heard Dave ask “Are you getting all the referrals you want for your business? and “Do you get referrals predictably and consistently or by chance?” Dave explained to the audience how business owners understand the value of referrals but they don’t often have control over their referral business. He told of how ‘Referral Marketing’ is the most effective form of marketing for businesses with limited marketing budgets and explained that if you are willing to invest the time to learn specific referral marketing strategies, tools, and techniques you can double, even triple your sales in months – without spending additional marketing costs. The workshop, which involved the participation of the attendees, covered important aspects of business, including, ‘Learn how to develop a strategic referral network’ ‘Discover who should be in it and how to find them’ and ‘Measure how well your current networking activities are supporting your referral marketing….or not!’ Dave introduced some specific techniques that gave a great insight to the possibilities of generating more sales in less time by doing business by relationship – underlining that if you don’t have a referral marketing plan for your business and unless you can find more time and work harder than you already are, then you really do have to work smarter and not harder! The Red Door on Berry Street played host to this third featured Professional Liverpool networking event and the evening was enlivened by the always entertaining and passionate John Haynes. John is the founder of the Liverpool International Coaching Academy and one of the world’s premier business consultants and motivational speakers. He has over four decades of mentoring top companies throughout the world and, as everyone who has ever met him will know, is an enthusiastic and compelling speaker whose passionate belief in doing good and willingness to help others never fails to inspire – “Let us Fly with the Eagles” is his motto and he will always do his best to ensure that those seeking his advice and help will be motivated to do just that! The drinks and nibbles kindly provided by the hosts were followed by one of John’s inspirational talks, on this occasion regarding ‘How to achieve your sales goals in 2018’ – and there is no doubt that all of the guests will have left for home with a more than positive mindset!